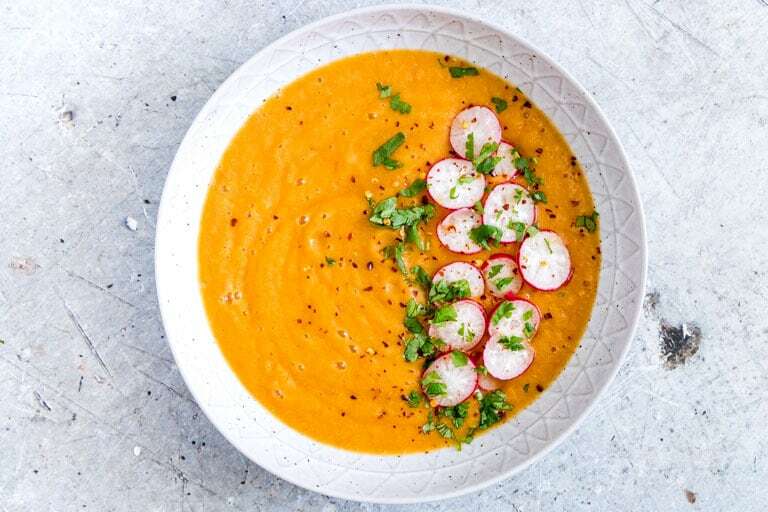 This Mexican Spiced Instant Pot Cauliflower Soup is easy, comforting, smooth and creamy with just a handful of ingredients. 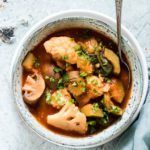 It is a great Low Carb Soup recipe for weeknight dinners and is suitable for people following a Low Carb, Vegan, Paleo or Gluten-free diet. Find Weight Watchers points and meal prep options in the post. Hey Soup lovers. 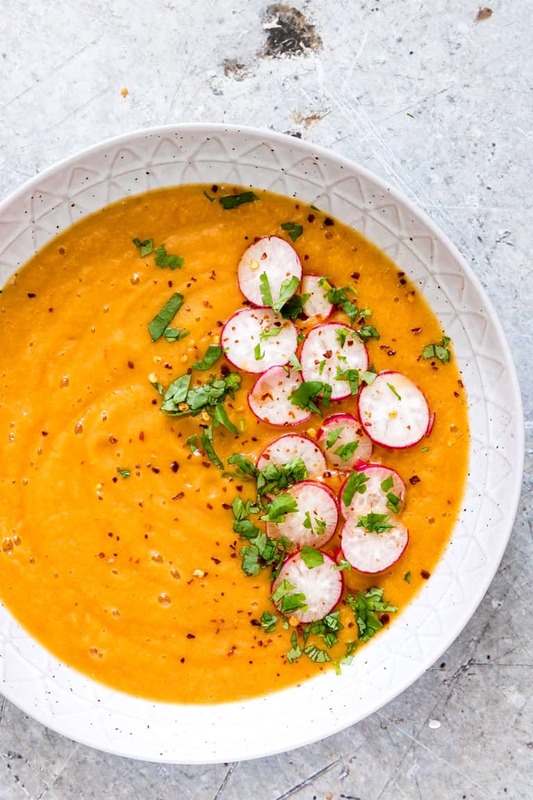 If you’ve been cooking along with me, you’ll know that I’m a pretty big fan of all things soup. 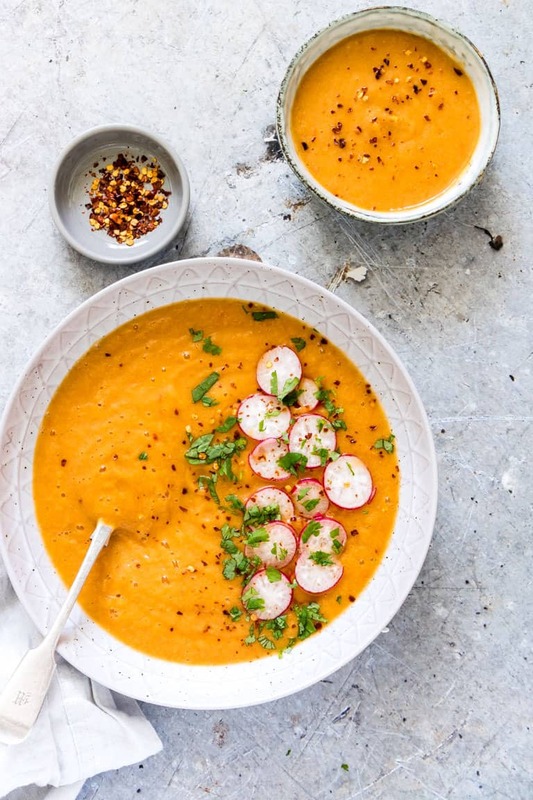 Especially if the soup comes together with only a few ingredients and is packed full of colour, flavour and a little dash of spice. So enter this awesome Mexican Spiced Instant Pot Cauliflower Soup. This Creamy Cauliflower Soup is fragrant, needs only 5 mins of prep, is quick to whip up in your Instant Pot, and is soooooooo adaptable that it is appropriate for any time of the year. All the good things people, all the good things. This post contains affiliate links for your convenience (which means if you make a purchase after clicking a link I will earn a small commission but it won’t cost you a penny more)! For more information, check out my disclosure. I use and love the 8qt, my extra Instant Pot Insert & sealing ring. Store leftover soup in these bowls. And costs just pennies to make. Step 1. Saute the onions, peppers and bay leaf until onions are soft. Step 2. Switch off the heat and stir in the garlic, paprika, cumin and chilli. Step 3. Mix in the cauliflower florets, vegetable stock and salt. Step 4. Cover your Instant Pot, set the vent to ‘sealing,’ select the manual or pressure cook button (dependent upon IP model), select high pressure and set the timer to 7 mins. Step 5. When done allow the pot to NPR for 15 mins before releasing the rest of the steam using quick release. Step 6. Let cool for a few mins, before removing bay leaf and pureeing with an immersion blender. Your soup is now ready to be served…..
Because sometimes we need to make it on the stove top instead….. Step 1. Saute the onions, peppers and bay leaf in a pot over medium heat until onions are soft. Step 2. Stir in the garlic, paprika, cumin and chilli followed by the cauliflower florets, vegetable stock and salt. Step 3. Cover and simmer for 20 mins until the cauliflower is cooked through. Step 4. Let cool for a few mins, before removing bay leaf and pureeing with an immersion blender. What Spices Do You Need For Cauliflower Soup? I have kept the spices very simple in this recipes. I used Mexican inspired flavours of cumin, smoked paprika and chilli. 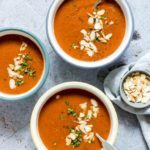 But you could use just garlic and nutmeg for an even milder flavour, or curry and turmeric for a Creamy Indian Cauliflower Soup. 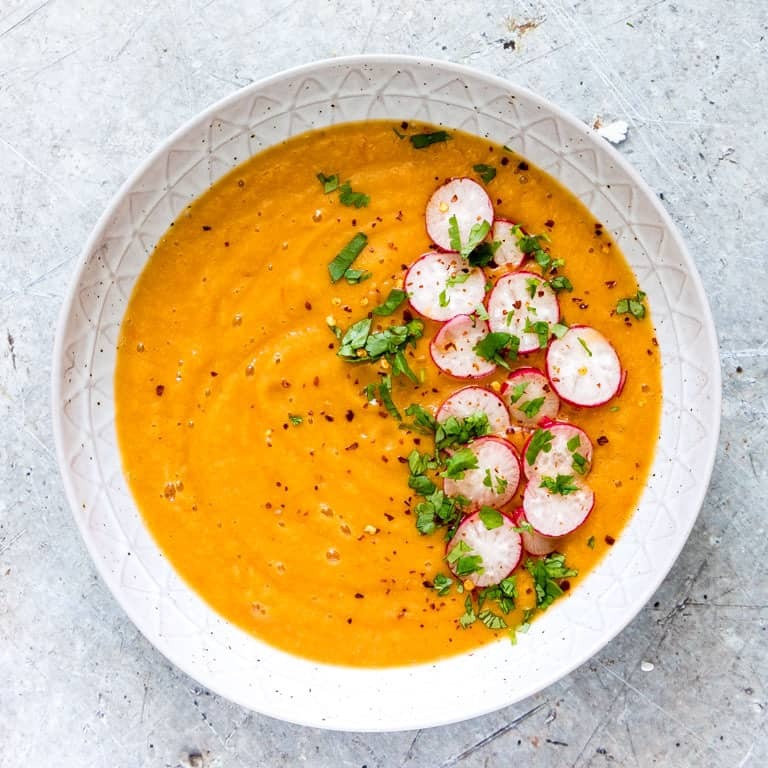 Here are a few Cauliflower Soup toppings ideas – radishes, roasted cauliflower florets, chilli, tomatoes, fresh chopped herbs, avocado, and roasted nuts. If not vegan then you can use crispy bacon, extra grated cheese, chorizo bites and sour cream. One of the best things about using cauliflower is that it is naturally creamy. So all you need to do to make a creamy cauliflower soup is blend it as is and you are good to go. Feel free to use an immersion blender and blend directly in your Instant Pot. Or let it cool down a bit and blend in batches in a tabletop blender. If you want to kick up the cream factor a little bit then you can make Cauliflower Soup with cream. Start by adding about 60ml (1/4 cup) of single cream or double (heavy) cream after the soup has finished cooking. If you want to to keep your Cauliflower Soup vegan, then use coconut milk instead which adds a lovely exotic depth of flavour. Cauliflower Soup with Cheese is a favourite around these parts. All you would need to do is add about 100g (.9 cup) of finely grated cheddar cheese to the warm Cauliflower Soup and mixing it till it is all melty and cheesy. The version cauliflower soup version I have given you here is pretty thick. If you would like to make it thicker, then the easiest low carb way will be to reduce the stock you put in the soup by (125ml) 1/2 cup and go from there. You could reduce it even more if you prefer. If you want to make it thinner instead then please do add 125 ml (1/2 cup) of liquid at a time. Can Cauliflower Soup Be Frozen? Great question. In this case, the answer is yes as it does not contain any dairy. It is great then for whipping up a batch and freezing for quick weeknight suppers and impromptu dinner parties. Just defrost and reheat before serving. 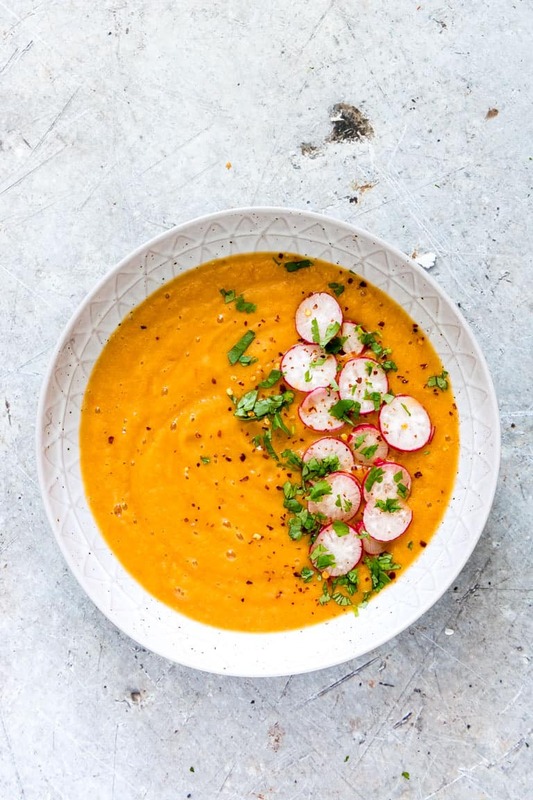 And tip moment here, if your soup looks separated after defrosting, simply add to a blender and puree back into a smooth consistency. Let the soup cool down then transfer into these very handy Ziploc freezer bags. Store the soup in the freezer for 3 months. Remove the soup from the freezer the night before needed and let it thaw in the fridge. For a faster thaw, you can add the bagged soup into a microwave and thaw according to the microwave’s instructions. Transfer the thawed soup into a bowl and reheat in a microwave. Or transfer the thawed soup into a saucepan and reheat over low to medium heat. If you replace the 1 tbsp olive oil used for frying with a calorie-controlled cooking spray, there are ZERO Freestyle and PointsPlus points in this soup!! If you want to keep it low carb then add in some grilled broccoli and grilled courgettes/zucchini to have your very own broccoli and zucchini ‘cauliflower cheese’ – without the cheese of course. Add in some cooked quinoa, cooked sweetcorn and avocado to have a Mexican Cauliflower bowl. If not vegan, serve it alongside chicken breast marinated in any of my 7 easy chicken marinades. Thank you for reading my Low Carb Instant Pot Cauliflower Soup recipe post. 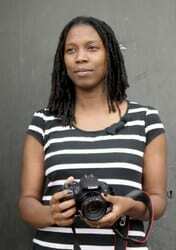 And please visit again as I continue dreaming up recipes, traditional African recipes, African fusion recipes, Sierra Leone recipes, travel plans and much more for you. Thanks for supporting Recipes from a Pantry, UK food blog. Don't forget to tag #recipesfromapantry on Instagram or Twitter if you try Mexican Spiced Instant Pot Cauliflower Soup! It is really, really awesome for me when you make one of my recipes and I'd love to see it. You can also share it on my Facebook page. Please pin this recipe to Pinterest too! Thank you for reading Recipes from a Pantry. This Mexican Spiced Instant Pot Cauliflower Soup is easy, comforting and creamy and recipe for weeknight dinners. Switch the Instant Pot on to the saute setting and add the oil to the Instant Pot Insert and saute the onions, peppers and bay leaf if using for 4-5 mins until the onion is soft. Switch off the heat and stir in the garlic, paprika, cumin and chilli. Mix in the cauliflower florets, vegetable stock and salt. Cover your Instant Pot, set the vent to 'sealing,' select the manual or pressure cook button (dependent upon IP model), select high pressure and set the timer to 7 mins. When done allow the pot to NPR for 15 mins before releasing the rest of the steam using quick release. Let cool for a few mins, before removing bay leaf and pureeing with an immersion blender. Saute the onions, peppers and bay leaf in a pot over medium heat until onions are soft. Stir in the garlic, paprika, cumin and chilli followed by the cauliflower florets, vegetable stock and salt. Cover and simmer for 20 mins until the cauliflower is cooked through. Step 5. Let cool for a few mins, before removing bay leaf and pureeing with an immersion blender. This looks gorgeous, not just for the colour but all the flavours. 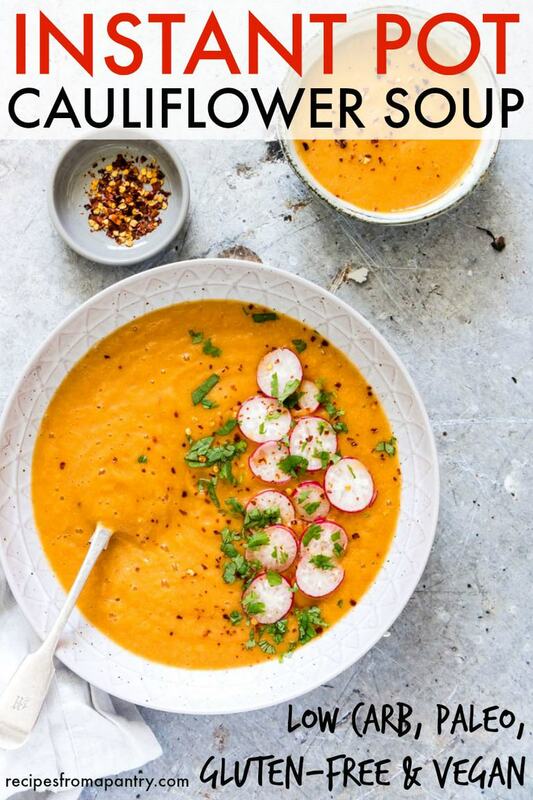 I love cauliflower but rarely think to make soup with it, but love the look of this. I wouldn’t have thought to make a cauliflower soup, but it’s so pretty! 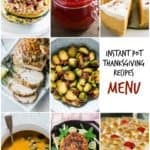 Love all of the flavors, and using the Instant Pot makes it a perfect summer recipe. I love that you put smoked paprika in this soup. That will really kick up that cauliflower with a delicious flavor. Such a pretty soup also! The color on this soup is gorgeous! It sounds delicious too! That soup looks wonderful Bintu and I love the spices you used and the colour from them and the red pepper. This is on tonight’s menu! 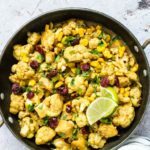 I have a head of cauliflower needing to be used, and this recipe just popped up on Instagram and looked delicious, so I am inspired to make it myself. Thank you for sharing this recipe! What a wonderful & versatile recipe! I had leftover, Chipotle Pepper marinade broth, from cooking Chicken legs in the instant Pot (then broiling them). I didn’t know what to do with the seasoned broth but I didn’t want to toss it. I came across this recipe & realized I could use the broth in this soup. I added some water, a bit more Cumin & the Cauliflower and now it’s in the Instant Pot & smells wonderful! After I blend the cauliflower I’m going to add Cheese, Zoodles & Shredded Chicken Breast. Perfect for a cold winter evening!